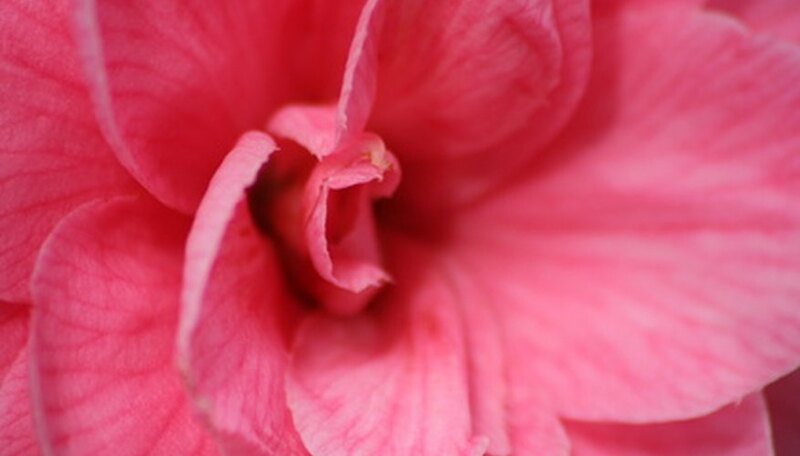 Camellias are flowering shrubs that can sometimes grow as trees 40 feet tall. One variety, Camellia sinensis, is the plant from which green, oolong, and black teas are made. Camellias, native to Asia, were introduced near Charleston, South Carolina, in 1786. They have numerous pink, red or white flowers. One popular way of propagating camellias is from cuttings, which ensures the offspring have flowers the same color as the donor plant. Use a sharp rooting knife to take a cutting from the current year’s camellia growth. Make your cutting at about a 30-degree angle to expose as much of the cambium, or growth wood under the bark, as possible. Taking the cuttings in the morning, when leaves have their highest water content. The cuttings should be long enough to include at least 2 leaves and one leaf node to increase your rooting success. Fill a peat pot with a rooting medium like peat moss, pearlite, or vermiculite. Soak your peat pots before filling them so they don't wick moisture away from the soil as your camellia roots. Make a hole for your cutting in the rooting medium with your finger. This hole should be about twice the width of the base of your cutting. Making this hole wider than the cutting will allow you to insert it with rooting hormone and not have the hormone scraped off by the sides of the hole. Pour some rooting hormone powder onto a paper. Do not dip the cutting directly in your bag of hormone. This could contaminate the hormone. Roll the cut portion of the cutting in the rooting hormone. Coat all sides of the bottom 1 inch of the cutting. Tap off any excess. Slip the cutting into the hole in your rooting medium. Gently cover the cutting. Water your cutting until the rooting medium is moist, but not soaking wet. Place the peat pot and cutting into a clear plastic bag to make a miniature greenhouse. This will help keep the rooting medium from drying out. Make sure the soil does not dry out, and keep the pot in the plastic bag for a couple of weeks. Poke holes in the bag once roots begin to form. After about a month, remove the plastic entirely. Slip your finger next to the plant to feel for new roots. Do this gently to avoid damaging the roots. If you see new growth on your cutting, you likely have roots. Either feel for roots or tug gently on the plant to feel for the resistance against the rooting medium. Do everything with newly rooted cuttings gently to prevent root damage. Plant the newly rooted cutting in potting soil after four to six weeks, or when it has developed a sturdy root structure.